In the years since OneBusAway took over the realtime arrival market, Busview, the old UW website that provides recent bus locations rather than expected arrival times, has been quietly doing its job, largely forgotten. The color code is not yet clearly explained on the site. Most buses are blue; when there hasn’t been a position report for 10 minutes, it turns gray. The SLU streetcar is Black, Red, and Purple, corresponding to the actual colors of those streetcars. Link, of course, has no public real-time data. At the moment, it’s hard to tell at a glance which direction the bus icon is moving. Filer has the heading information and should have the indicator running within a week or so. Another problem is that the icons don’t show up on some mobile browsers, including my Android phone. In the next “week or two,” Filer expects to tweak the site to work on more browsers. A beta version currently incorporates the OneBusAway feed, which includes Pierce and Intercity Transit, and that should also be stable in the next week or so. Currently, when you click on an icon it shows all possible paths that bus route could take. Filer can use the OneBusAway data to instead display the path relevant to that trip. He is also toying with the idea of connecting it to webcam feeds so that you can physically see the bus on its way. Filer says that Butler (an STB alum) is interested in making a mobile app, though he’s not sure when that might be ready. Busdrone is to onebusaway as a system map is to Trip Planner. One gives you a single answer, digested to what you exactly need to know. Map-based displays let you see all the options at one time. The two approaches complement each other, so it’s good that busview is getting a modern update. *Andrew also helped out a bit with the STB back end a few years ago. Does/will this use GPS data, or is it still using the old pre-GPS system? Well since they’ve said they’re using the same data that feeds Busview, I would assume it’s using GPS data. This is based on the fact that I’ve seen 7000’s on busview, and those never had the old system in them (I believe). Nothing uses the pre-GPS data system. FCC mandate. Is it just me, or is this really incredibly cool? Cool, yes, but is needed for everyday bus use? I could see myself using it on a snow day, but that’s about it. I certainly would consider using this to try and find routes to various parts of town. Or to explore more bus routes. Or just to stare at. Nice work. I much prefer Google Maps as the background for just about any map related project. For example, I wish Metro put their routes on Google Maps, instead of a PDF. It it much easier to work with Google Maps than work with a PDF (although much harder to print). The PDF route maps on Metro’s website are awful. It makes figuring out routes actually quite hard to figure out, and therefore makes it harder to use the bus. If they overlaid their routes onto a Google Maps platform, I would probably use the bus more by virtue of understanding the network of routes better. As it is with the PDFs, it’s so hard to figure out the routes and how the connect/ when they connect. I tend to use this one for most trips. Metro routes are on Google Maps, in a roundabout sort of way. I usually just use the One Bus Away website for looking up route maps, though it only lets you see one at a time. I wish there was a way to show several with different color coding. I wish this was true. My experience with OneBusAway is “realtime” isn’t a big improvement over looking at the printed schedule. I had to give up on OneBusAway after multiple occasions of leaving a bus stop due to a bus showing as being delayed 20+ min and arriving a couple minutes later. Not to mention countless times of ghost 17X buses that approach a stop despite showing as already departed 3-5 min earlier..by that point I’m already walking to a different stop. I realize this isn’t the fault of OneBusAway but they also don’t seem to have a solution. I generally work under the assumption that if a bus is being shown as massively delayed, or even if I’m just close enough to the start of the route, default to the printed schedule, which generally means subtracting the minutes delayed from the minutes to arrival. It would be nice if OBA would recognize when a bus is laying over and assume it’ll leave at the post time instead of having progressively more absurd delays until it actually leaves. Loading into Firefox on XP freaked out my screen … made it all splotchy like broken graphics. Also did not scale well. I have zoom working at 150%. Could not see how to enter search like zipcode. Also clicking area was “touchy”. Took me out of zoom mode back to initial screen when I didn’t want to go there. Just crashed Firefox on Windows 7. Very slow, trying to load too much data on a full size screen. The size of the screen isn’t the issue, it’s the sheer number of markers. I looked at where Firefox kept crashing; it was at the var marker = new google.maps.Marker(... (line 118) and ctx.beginPath(); (line 258) lines. For the first one, Andrew, have you considered using a marker manager? I don’t know what the second one is doing, so no suggestions. Could not see how to enter search like zipcode. I had similar problems. I think this is a common development situation. The developer write the code on a fast machine, but people run it on slow ones. I’m using a four-year old laptop, and it doesn’t seem to be particularly taxing on my machine. The icons are rendered client-side, which saves a lot of network traffic, but yes, it does require some CPU. But even that works (a bit slowly) on a first-generation iPad. My rig is tower PC with a quad core Phenom II Black 9850 and nVidia gpu. Still had trouble. Andrew also helped out a bit with STB’s back end in the early days. I remember the early days, but I don’t remember that. I think you mean the 2008 sound transit campaign. You’re right that it wasn’t early days. I’ve rephrased. They really need to get real-time info working for Link. The question I have are any of these other services needed? The new transit stuff in the new Google Maps that Google showed off at I/O was pretty slick, and I’m not sure I need much more than that. THIS. THIS is exactly what I want. I had no idea it existed. One Bus Away is great (when it works, which is ~half the time) if you know exactly what bus you want and what stop you’re standing at, but when you’re not at a stop, it is incredibly helpful to have a way to see what buses go nearish to there, and where they go. I spend a fair amount of time wandering around loose in strange places, and I know that there’s a bus a couple of blocks away, but which way? Which one goes downtown, and which one in some unintuitive direction? Being able to click on a bus and have the route display is great, great, great. This looks like the answer to my prayers. I agree, this could be very useful when you’re not that familiar with the area and the routes. This also includes Pierce Transit – which Bus View did not include. Hopefully Community Transit and Everett Transit will be added as soon as they are available. I don’t think CT or ET have any sort of tracking on their vehicles yet. 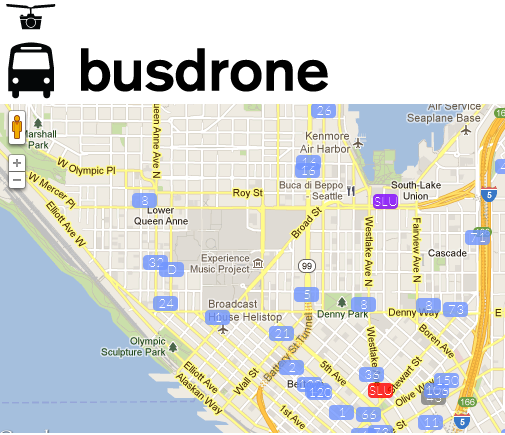 Busdrone does have support for Intercity Transit which uses GPS to track their fleet. CT must have something, as the sign that tells you where the next stop is has to get its data from somewhere. And I highly doubt that the data source is the driver manually punching buttons into his computer between every stop. That’s GPS. The GPS on the bus talks to the computer on the bus to say where it’s at. The next step is the computer on the bus talking to the computer at HQ. That step is underway. I monitored buses on 28th W for a short while this afternoon. The 2:50 #24 inbound arrival at 28th W and W Blaine was shown correctly on busdrone up until about W Crockett – but then disappeared. Shortly thereafter, a #24 (not in the schedule) appeared on busdrone at 34th W and W McGraw, and did the #24 “grand tour” until about W Armour on 28th W, where it disappeared. No such bus ever made it to 28th W and W Blaine, so I assume it was a “ghost” bus. Pretty much the same thing happened to the 3:23 inbound #24. It did seem to get the 2:57 (at 28th W and W Blaine) outbound #24 right (including how late it ran), all the way from 1st N and Denny to the terminal. It appears that busdrone may be quite useful, once one figures out (if possible) the problems in the data feed – which are also what I assume often causes the bizarre data displayed on Bus Tracker and OBA. Moreover, busdrone might help one figure out the patterns of the problems (if as recurring as it appears this one is). As far as I can tell all of these services are using the same faulty data feeds and really it is Metro that needs to fix that. Already having budget issues I doubt that will ever get fixed nevermind the fact that it would greatly enhance ridership by making riding easier. While this is great and it is great that it is open source (OBA’s and busview’s data feeds could take a hint from this) I’m a bit disappointed to see that upon offering up suggestions and bug reports the busdrone issue tracker was promptly closed. Until Andrew opens up the issue tracker again feel free to report bugs and offer up suggestions at https://github.com/bbodenmiller/busdrone/issues. I’d prefer people didn’t use the issue tracker for a generic wishlist, as you were doing last night, Ben. Specific, reproducible bugs with enough debug information where I would have a reasonable chance of fixing the bug would have been fine. Busdrone is under active development (it’s only a couple weeks old! ), and I’m aware of what most of the bugs are or would be. I also have my own feature map planned out, and so I’d prefer to spend my time fleshing out my own vision right now. And remember, I’m doing this on my own time because I enjoy it. Please keep that in mind before you get too demanding. You rock Andy, keep it up! At home I liked the site, but at work it’s useless (and heading out the door at work is where I would use it). Our corporate firewall blocks busdrone.com as “Potentially Damaging Content.” It doesn’t say much more beyond that, though. That’s hilarious. I wonder if it’s as simple as that it’s a newly-registered domain. I’m guessing that phishing attacks etc often use newly-registered throwaway domains, and I only registered busdrone.com 12 days ago. This is great, I love that I can see where multiple buses are when Im standing near 4 stops that will get me to where I need to go. OBA takes time to go between those stops, especially if you are taking into consideration transfers. One request I have those is that busview had a really cool strip map that showed up when you clicked on a bus that showed that route and a simple line showing all other vehicles on that route and where they were relative to timempoints spaced on it. Very simple and helpful. I tried BusDrone on Firefox, Internet Explorer, and Chrome, and there was a noticible difference in performance and responsiveness between them. Chrome performed the best, Firefox the worst, and Internet Explorer in the middle. I tried it in Lynx and it didn’t work at all. I want my money back.